Within Temptation‘s latest album is Resist. At one point, it wasn’t clear if the band would continue, but they found their path and a musical approach that incorporates some new styles alongside what they have done in the past. 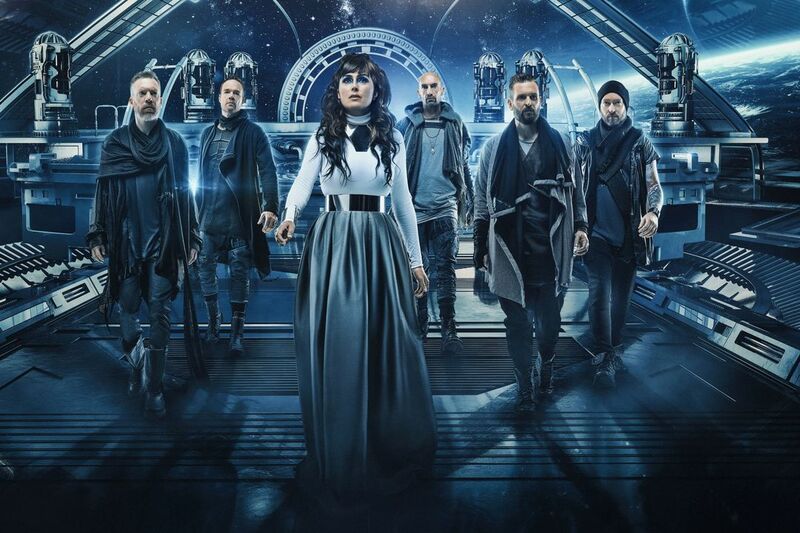 I spoke with vocalist Sharon den Adel about the challenges of making the album, their upcoming North American tour, her solo project My Indigo and other topics. Chad Bowar: The future of the band was in doubt. What turned it around and set you back in the right direction again? Sharon den Adel: First I have to explain what was the reason for it, that it was going to be maybe that Hydra was the last album, just because lack of inspiration after that album. It took us five years to write a new album. And there were several reasons why we had writer’s block or felt uninspired. First of all, I had a lot of stuff in my personal life that was happening. And it made me realize I really had to think about, okay, I’ve been on this roller coaster for 23 years. Do I still want to do this for another 23? Do I want to do it differently? I missed out on a lot of things doing this. My big passion, and my biggest love, was to be able to be touring with a band all over the world and doing this. On the other hand, I missed out on a lot of stuff at home. Parents and friends, everybody’s got families. I missed out on a lot of stuff. So I just realized that after Hydra, I really had to make up the balance and stuff. And then, also what happened is I had writer’s block. It was all connected. But I wasn’t the only one having problems writing. Other people in the band who were also writing had the same problem. In the meantime, to get rid of the writer’s block and just doing something different sometimes really helps to get back to make clear which direction you want to go, also with your life. I did something else in between it, my solo project My Indigo. It’s a different kind of music. It’s singer/songwriter kind of songs. It’s more alternative, and a bit of an urban kind of influence. It has a lot of different flavors that I never used for Within Temptation, but it fit better in the time that I was going through all of this process, finding my new way for Within Temptation and deciding if I even wanted to continue with the band even. So I did this project in between. And it really helped us to find a new way. It helped me back to Within Temptation again. I could deal with a lot of stuff through My Indigo by writing these songs and doing something different, getting out of my comfort zone, looking at music in a different way again and also, to a different genre of music. And I think a lot of things that I learned from the project, not just me. The producer I was working with for My Indigo also worked on the new album for Within Temptation. We both made a development that helped us to do a different structure for Within Temptation, but also the songwriting was very different. Before this album and any album before it, we had different rhythms, we had a different way of singing. But also, the contribution of the singers that we eventually asked. Also, my own way of singing was very different than what I have done before. The timing is different. So many things really resulted from the urban stuff. We learned a lot from that, actually. We transformed a little bit into Within Temptation with some influences of that, which makes it sound more modern, in my opinion. We had a lot of things happening at the same time, not being inspired by any kind of music and eventually, ended up looking at different kind of music genres than typical metal or rock where we normally get our influences and inspiration from. We looked to different music scenes and that really helped us evolve a new direction for Within Temptation eventually. And that made it fun again, because that’s the aim that we always have is to find a new way of finding something that makes enthusiastic to write again. And it happened actually by listening to different kinds of music than we normally do. You talked about the guest singers, who are all very different. Yeah, totally. And that’s also very nice, because they all add something different to a different type of song. And also, because they all have a different type of voice. We asked Anders from In Flames because he’s more experienced with a screaming voice. And we needed his screaming voice on “Raise Your Banner.” And for “The Reckoning” we needed more of what Jacoby (Shaddix, Papa Roach) had. It’s intense, direct, but also a certain anger to it and also vulnerable, somehow. Jasper (Steverlinck) was more sensual and also very emotional. There are three very different vocalists, indeed. In Flames is a band like yourselves whose sound has evolved over the years. Yeah, but I think Papa Roach as well, actually. I was thinking about how they started and what they’re doing now is so different. Of course, they have the same kind of influences still. But they really evolved from where they came from. They went along with their time also. Another thing that’s new for you guys is the record label. Tell me how you came to sign with Spinefarm. We signed with them for America. We’re signed with Universal in the rest of the world. They really believed in the songs that we were presenting to them and we had a really good connection with them, how they responded to our new ideas for the new songs and what direction we were going. Eventually, we chose them for that reason. We had the right vibe or wavelength. They were very enthusiastic and liked our new direction. What led to the album being pushed back from last year to early February? There were some production problems. I didn’t really get into exactly what it was, because I was like, “Yeah, it’s only six weeks, it’s not months and months, luckily.” But something went wrong with the production and they had to reproduce the whole thing again. Has what you expect from a record label changed over the years? I think the music industry has changed a lot. They’re still doing more or less the same thing, but I think it’s slightly changing. Nowadays, instead of getting on the radio, it’s now better to get you on music platforms which is more important nowadays than radio in most countries. It’s the same, but it’s not the same. For us, a record company has always been more or less the same in that they never were involved with any decisions that we made for the future or for any music that we made. We always had the freedom to make and do whatever we wanted, because nobody really understood what we were doing. They didn’t understand the scene we were in most of the time. But it’s always nice to hook up with a more metal or rock or alternative kind of label, because they are more used to bands like us so they know how to present us in the right way and to the platforms that are out there. Another thing that has changed a lot over the years, especially with the development of social media, is how your albums are promoted. Back when you guys first started, maybe you released one single and then, the album came out. Now, it’s videos of you in the studio and lyric videos and regular videos and several songs come out before the album release. Do you like the transparency or you miss the mystique? There are more tools to make people aware that you’re out there, that you’re releasing a new album. But in the past, it was one single like you said. But essentially, when the album was out, nobody was interested any more to talk to you or the band. Okay, it’s out there, so what else can we talk about? And now, you can have a real nice build-up to a certain point where everyone’s really excited. And you can release little snippets and stuff. I like the technology, because it makes it actually, for me, more exciting to watch the band release something more than just one single and then the whole album. Of course, you’re excited for the whole album to come out. We play five songs live during the tour that we’ve been doing before the album comes out. And it’s not the same as it is on the record, so it’s always going to be different. But still, if we wouldn’t have done that, then the surprise would have been bigger, but I think it did make people aware that we were releasing a new album. And I think all of our fans are ready to go. You are getting ready to come back to tour in North America. How are you doing when it comes to building your North American fan base? We go there the same way as we did before. We play three weeks to six weeks. That’s what we did in the past, and we’re coming over again for three weeks. And we’ll see if we’re coming back again. It depends on what else comes our way. It’s such a big country. It’s hard to travel. It takes so much time. And the world is so big for us. We have so many countries where we are a little bit bigger. We’re playing on different stages here in Europe and in Russia and in this part of the world. But I think there’s a certain capacity of how many fans there are that like a type of music. And I think we’ve reached them. I’m really happy that we’re able to come back every time and still sell out the shows. And that’s the biggest thing. And these are nice venues that we play. It’s not like it’s very small. It’s just really comfortable and beautiful places that we get to play. It’s just a pleasure for us to come over and enjoy your country and to enjoy our friends during these shows. It’s very relaxed, for us anyway. I’m enjoying it. With In Flames on the bill for your North American tour, can we expect a nightly performance of “Raise Your Banner” with Anders? I hope so. I’m really looking forward to that. I didn’t ask him yet. The chances are quite good, I think, to get them on stage. How challenging is it so many albums in to construct a set list that you guys like to play and that the fans like to hear? It’s challenging, because you always disappoint somebody who has a favorite song that you’re not playing. But what we’re doing is taking songs from every album and those that are the fan favorites. We think we know which ones those are. And sometimes it depends where you’re playing, which country, which song did better there. We make a nice combination of both the new album and old albums. And it depends a little bit how long you play. Most of the time, we play one and a half hours. There’s always a lot of opportunity to put a lot of old stuff in there, as well. And we try to vary it little bit here and there. You can’t please everyone, but you can make a nice mixture. And I think we’ve done that this time especially, because we have a different sound with this album. We tried to fit older songs together that fit our new album as well to have a nice red line between the songs so that it all fits together and feels like one thing. You mentioned the My Indigo album before. Do you anticipate doing another one at some point in the future? I hope so, but it’s more something that I’m going to do on the side, because I do realize that having a project of this size with Within Temptation is very difficult. I’m a writer for both, so I’m writing My Indigo and I’m one of the writers for Within Temptation. So it’s a lot of work and a lot of effort. But I’m looking forward to doing both. But My Indigo will be a second plan, of course, because it’s something that I do on the side. It’s a project really. And Within Temptation is my first band. That’s something that I need to focus on mostly. But if I have time, I’ll try to give it another go for another album, because I really enjoyed the first one. It was very precious for me to be able to make that album. And it was very personal, also. But I think there’s more to write and I think that it’s good to keep continuing that, as well. I know music is very much a family affair for you. Are the kids getting into music yet? Yes, my son is. He’s nine. He’s playing really well and writing songs already, but it’s something that I don’t want to be involved too much in. We encourage him, but it’s very difficult to be in a music scene. Whatever you do, just do it as a hobby and you’ll see. Whatever comes out comes out. Just enjoy it, the fact that you can make music. That’s the thing that we’re trying to emphasize.